The Lesser Masked Owl is a small to medium-sized barn owl with no ear-tufts. 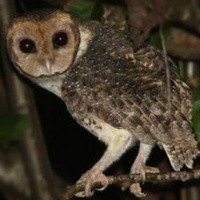 It is also known as the Moluccan Masked Owl. Description: The facial disc is pale rufous-brown, with a brownish rim that is finely speckled ochre-yellow. There is a brownish wash around the eyes, extending to the base of the bill. The eyes are blackish-brown and the bill yellowish-cream. The upperparts from the crown to the rump and to the wing-coverts are greyish-brown with orange patches, coarsely spotted with white dots that have black borders. The yellowish bases of the greyish-brown feathers are visible through them, giving an irregularly mottled appearance. Flight and tail feathers are greyish to rufous-brown with darker bars, contrasting with the wing-coverts. The entire underparts are whitish with coarse brown dots. The feet are feathered to the base of the toes. The toes are bare, and coloured yellowish-grey with blackish-brown claws. Size: Length 29-31cm. Wing length 227-251mm. No weight data available. Habits: Little known. Sometimes hides in limestone caves during the day. Voice: Three rapidly screeched whistles over a two second period. This is sometimes preceded by 3-4 slower, more drawn-out, higher pitched screeches. Hunting & Food: Not studied, probably similar to other Tyto species. 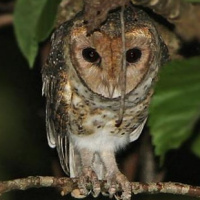 Breeding: The breeding habits of the Lesser Masked owl have not been studied. Probably nests in tree hollows. Habitat: Presumed to live in primary forest. 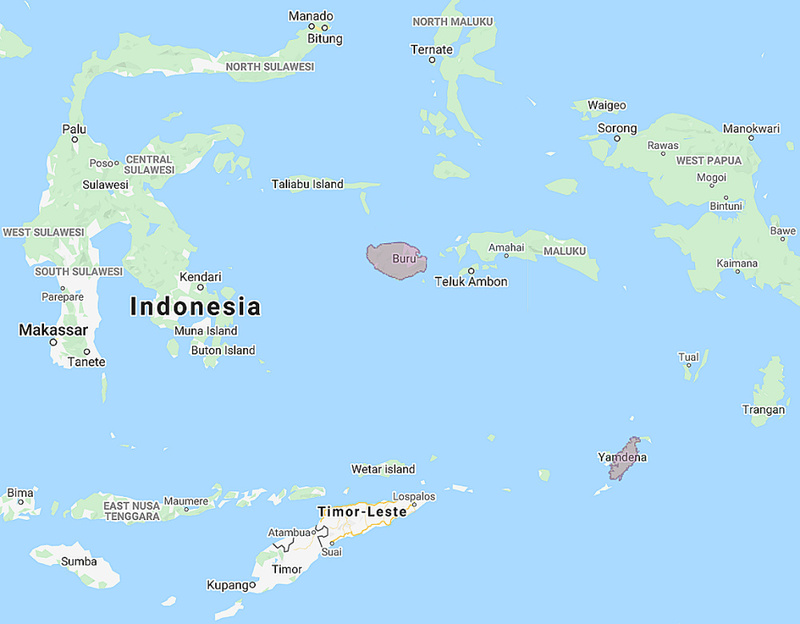 Distribution: The islands of Tanimbar and Buru in the Lesser Sundas. Original Description: Sclater, Philip Lutley. 1883. Proceedings of the Scientific meetings of the Zoological Society of London for the year 1883 (PZS). Pt.1, p 52-53. Page by Deane Lewis. Last updated 2016-02-29.